This is the kind of year I dream about. The very earliest date to begin the season of Advent is November 27th, and 2016 is a November 27th year. It won’t happen again until 2022, We have four whole weeks to anticipate the coming of Jesus. Four weeks to prepare and ponder the miracle of the manger. Let’s not let the season trump the Story. won over the fear that could have made her say no. I am looking forward to celebrating the season with you! If you would like to listen to the reading from Week One, Day One that was recorded last year, click here. 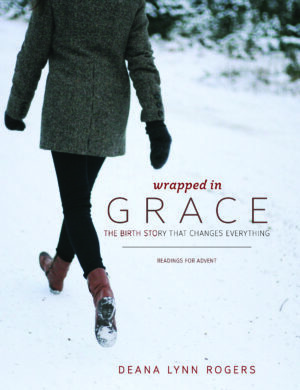 If you don’t have a copy of Wrapped in Grace yet, check out the preview on the link above, or follow the links over on the right side of this post or follow the link above to order your ebook or soft cover book for journaling. I would love to have you join us here. This evening a group of friends and I are gathering for cookies and tea, and to pray together as we begin this Advent season. Let’s not let the tinsel and wrappings of the season become more important than the story of love and grace that Bethlehem is really all about. How will you care out time to ponder the miracle this season?